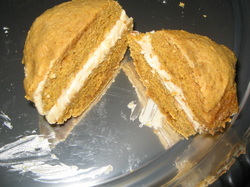 Delicately flavored pumpkin whoopie pies, filled with decadent vanilla frosting. Available in a variety of flavors such as: red velvet, chocolate, mint, vanilla with a variety of frostings as well. Alternating layers of chocolate and white cake frosted in creamy buttercream and decorated with various candies. An engagement party gift for a close cousin and her fiancee. A delicately spiced chai tea loaf drizzled with an icing sugar icing. 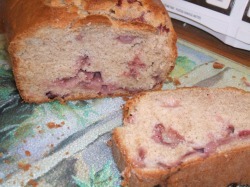 Delicious strawberry bread with fresh strawberries and a hint of cinnamon. 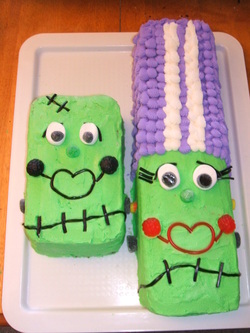 This was an "experiment" cake. 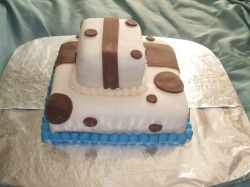 I made my own fondant, modelling chocolate and all the icings in between the 6 layers of cake. My friends and family did not mind being experimented on, and I discovered that homemade fondant tastes much better than store bought. A friend asked me if I could make her a christening cake that would match her daughter's gown. 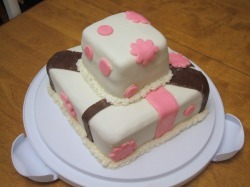 This is the first time I had ever tried patterning on fondant or making a fondant bow. 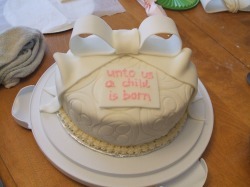 This cake was made for a very close cousin who is due to give birth in the coming weeks. I wanted something pretty and girly since we know the baby is a girl. It is six layers of alternating chocolate and spice cake. 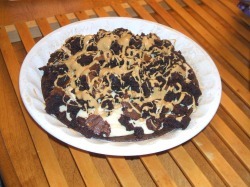 Brownies hollowed out and filled with vanilla pudding, then topped with the brownie pieces and drizzled with melted peanut butter. 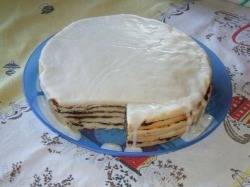 A traditional Icelandic dessert, vinarterta is prune and pastry layered, then topped off with an almond icing. 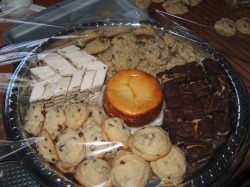 Clockwise from top; oatmeal raisin cookies, cream cheese brownies, chocolate chip cookies and vinarterta, with a 4" plain cheesecake in the middle. 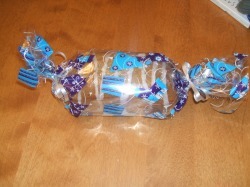 I donated this as a silent auction prize at my daughter's ballet recital. It included a certificate for an 8" plain cheesecake.